ACTUAL SIZE & HIDDERN ZIPPER : The dimensions are 18 x 18 inch ( 45 x 45 cm ). Set of 2 pillow covers without inserts. Please allow 1~2cm deviation because of hand-cutting and sewing. Hidden zipper is to be more humane, beautiful and smoothly. Suitable for sofa,bed,home,office. 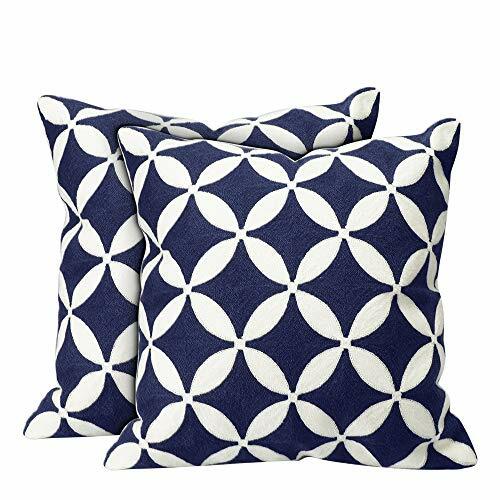 100% COTTON EMBROIDERY : The surface is made of exquisite and durable high quality cotton embroidery material. On the back is linen. The pattern is only on the front side,the back is solid natural fabric color. PEFERCT FOR DECORATION : Special Embroidery Craft - It is not printed. The patterns are very uniform and tidy, three-dimensional fashion. By decorating your home with these covers, you will have a cozy living place and also will receive a lot of compliments from your families and friends. Wide decorative effect, cars, sofas, offices, bedrooms, shops are suitable. EASY WASHABLE AND DRYABLE - Hypoallergenic, Anti-static, Breathable - Wash in cold water or 30℃ by hand then lay flat to dry. Do not bleach. Do not tumble dry. Do not dry clean. Avoid the sharp objects. If you want to machine wash, please use a laundry bag. Good Customer Shopping Experience : If you are satisfied with our product, please share your shopping experience and the good product to other customer and we will have a gift for the customer who share.